Why not have a knitted sign for a wool shop? One of my Winter projects finished. That being said, I’ve been knitting up a storm and also made some improvements to the Convent. Knitting has included shop items (we sell beanies, mitts and scarves at Convent & Chapel Wool Shop), shop samples (it’s great to show customers ideas for patterns and how the yarn looks knitted up) and some fun knitting as well. The fun items include Shockwaves in Hedgehog Fibres as well as Fringed, a Stephen West pattern also knitted in Hedgehog Fibres. This one is still on the needles. I’m usually a black/grey/brown person in terms of colours I wear but these gorgeous hand dyed yarns have tempted me to use a broader palate that will all happily sit over my black attire! For something a bit different, I’ve used my love of knitted blankets into making a knitted sign for the shop which happily hangover our balcony at the gorgeous historic Bridge View Inn in Rylstone. Over the last last week or two the weather has started to warm up, so I know I’ll be spending less time during the day with needles in my hands and more with the shovel, whippersnipper and hose. A yet to be named scarf in Adagio Alpaca. It was probably about eight years ago that I discovered knitting worlds other than sitting at home and knitting in my own company. Once I was brave enough to venture out, I found communities of knitters, both real and virtual. Many social knitting groups exist and meet at cafes, libraries, other public venues as well as people’s homes. Others exist on the internet and have the potential to expose knitters to an entirely new universe. Once introduced to a wider community of knitters, I found myself joining ravelry which is a sort of Facebook on steroids for knitters. Not only can it be a desktop for knitters to record their knitting projects and stash, but it also is the best and biggest source for finding patterns. Possibly the most important aspect, though, is the social one where knitters worldwide can connect over wider interests, share learnings and help each other. A great example of the latter is the concept of ‘Knit Alongs’ or KALs, when knitters commit to finishing a project, preferably all starting at the same time. Members post photos and information on what yarn they are using, photos of their progress and can ask for help from other participants as they go. It’s a great way to challenge yourself and learn new skills. A much more social, interactive and challenging way to knit. One of the more extreme versions of this is occurring as we speak. A popular designer, Stephen West, AKA Westknits, has organised one of his popular KALs titled ‘Westknits Mystery Shawl KAL 2015’. Why a mystery you may ask? 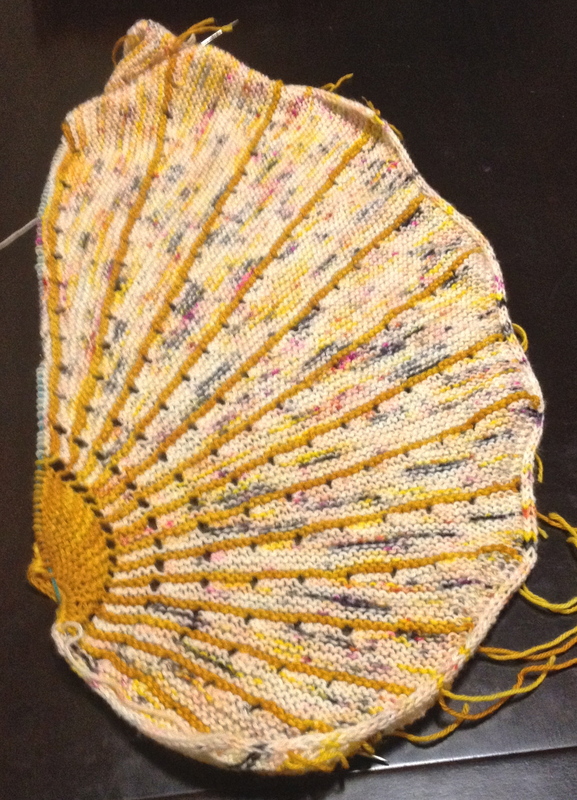 Well a mystery KAL has a twist – you can’t see the final outcome until you finish. All you know is that it’s a shawl and the yarn you will need to knit it. Clues (parts of the pattern) are released online in order over time and participants just go for it. This challenge, we have about one month to finish the project. Of course you can take as long as you want but many aim to keep up weekly. 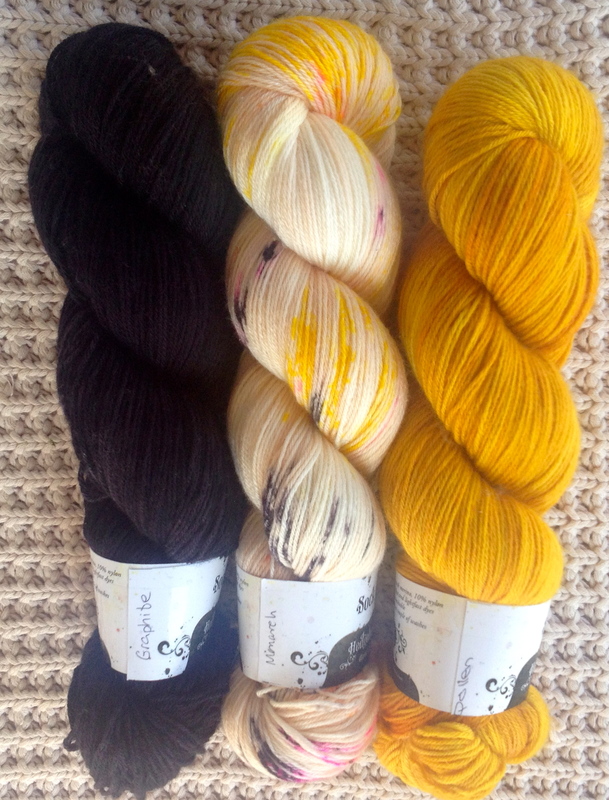 My Hedgehog Fibres colours – Graphite, Monarch and Pollen. 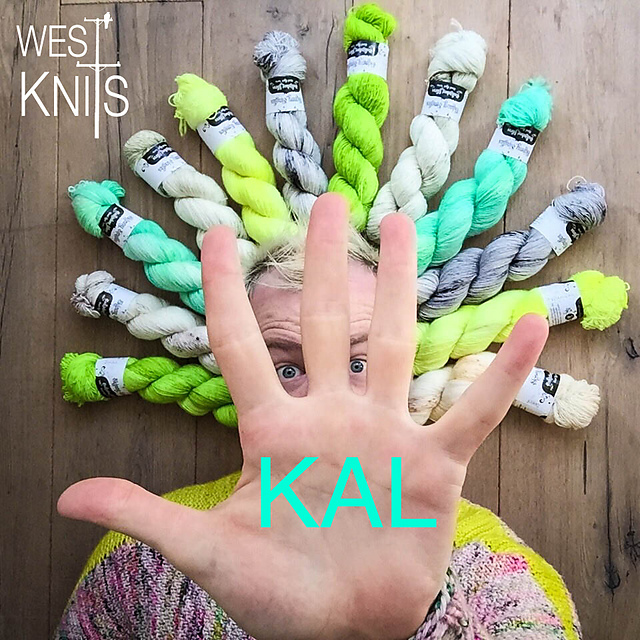 This KAL recommends Hedgehog Fibres which is one of our Convent and Chapel Wool Shop favourites and combined with one of our favourite designers, it was too good to pass up. Lots of our customers are also participating. In fact it seems a lot of knitters worldwide are joining in. The Ravelry Group started for the Knit Along now boasts over 4,500 members worldwide and growing, with separate groups for Norway, Denmark, Sweden, Germany, France, Spain and even and Aussies Down Unda group, all working on their ‘Doodler’ shawl. There’s also heaps of drama, those tackling new techniques for the first time, the dramas of colour selection, mistakes by the million (I’ve unpicked more than I’ve knitted) and not to forget, those running out of yarn part way through the pattern. We’re all following each other’s challenges – better than ‘Days of Our Lives’! This is a wonderful example of the power of the internet to connect likeminded souls and create virtual communities. It also challenges the concept of knitting being a dying art – far from it. It has now moved into a new realm, keeping up with technology and society, providing expanded creative outlets and connecting people worldwide. Younger knitters abound – no longer dependent on Mum or Grandma to teach them – you can learn so many techniques via YouTube for free. In fact, experienced knitters in this KAL are referring to the internet to learn or brush up on some of the new techniques required to progress their shawls. It’s a great way to push your knitting to another level and lots of fun along the way. A couple of us are knitting together here in Kandos, as we participate in an international event, and are sure to meet lots of others online doing the same over the next month or so. Mine is not racing ahead after a few false starts and I hope I don’t drop into the ‘Slowpoke’ lane. In the meantime, we’re just all enjoying the mystery, anticipation and collective enthusiasm of our fellow knitters. Clue one – still a few more ‘wedges’ to go. I’ve actually knitted about three times this amount but have undone so much along the way! 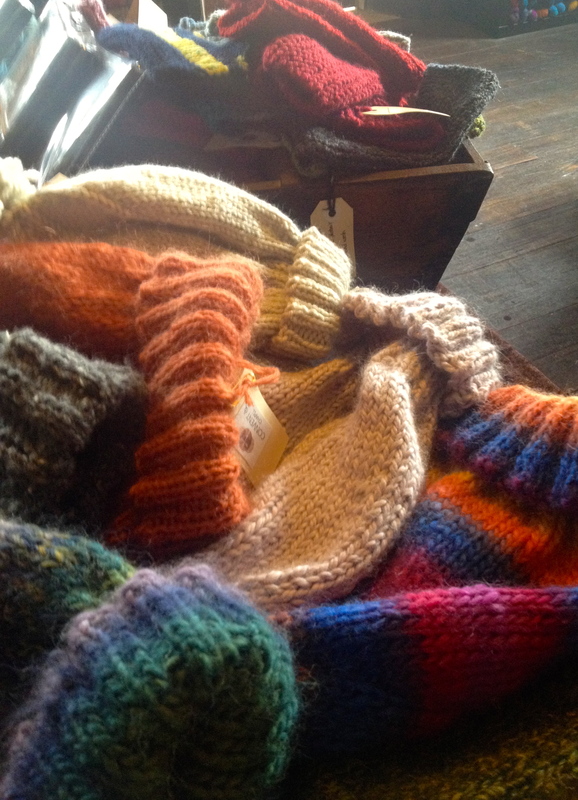 Beanies and mitts – great sellers for our visitors. For many years, I’ve usually knitted for others – baby shawls, rugs … but with the shop, I’m finding this pattern changing. I’ve come to realise I have a number of categories of knitting – some with sub categories and, of course, significant cross-over between them, which helps leverage my knitting time. Rylstone Ridge scarves – shop pattern, shop yarns and for sale! – three ticks! i) Hand Knitted Items For Sale – we are primarily a yarn shop but get lots of non-knitting tourists (yes, they do exist) popping in and would like to have items of interest for them to buy. After all, this is a business, not a hobby. 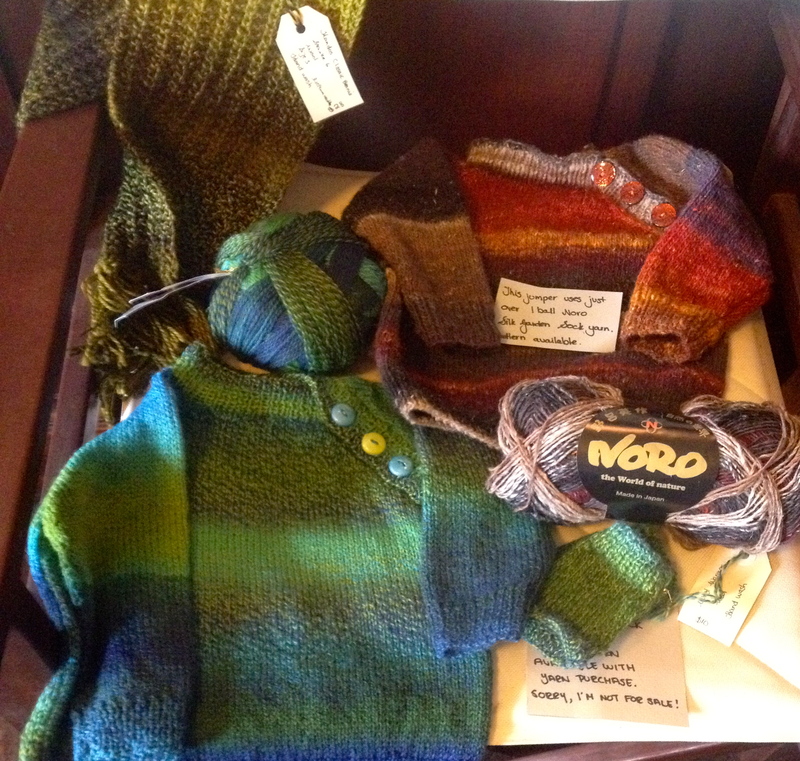 So we knit simple items – predominantly fingerless mitts, beanies and scarves. Most are our own patterns (or easy to obtain ones) and mostly in our own yarn, so they double up as shop samples (although we also use some of our own stash). We struggle to keep up with demand as they sell quickly. Whilst I might prefer to spend more time on challenging knitting, it’s rewarding to see them sell quickly, are relaxing in front of the television and they provide a great additional line of revenue for the business. We obviously leverage them by using our own yarn so they more often than not help us sell shop yarn as well. Shop samples – our patterns in our yarns. Simple projects and good examples of how the yarn knits up. 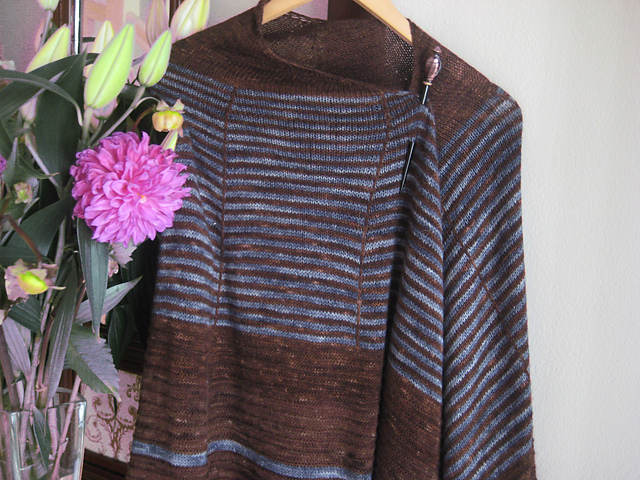 ii) Shop Samples – as mentioned above, we make up our own patterns and accompanying knits. We also knit appealing items that are readily available on the internet, primarily Ravelry, the knitter’s web hub. Whilst some can also be items for sale, more often we keep them as shop samples on display to inspire or tempt people to have a go and show them how the yarn knits up. The beginnings of one of the “sign” blankets. 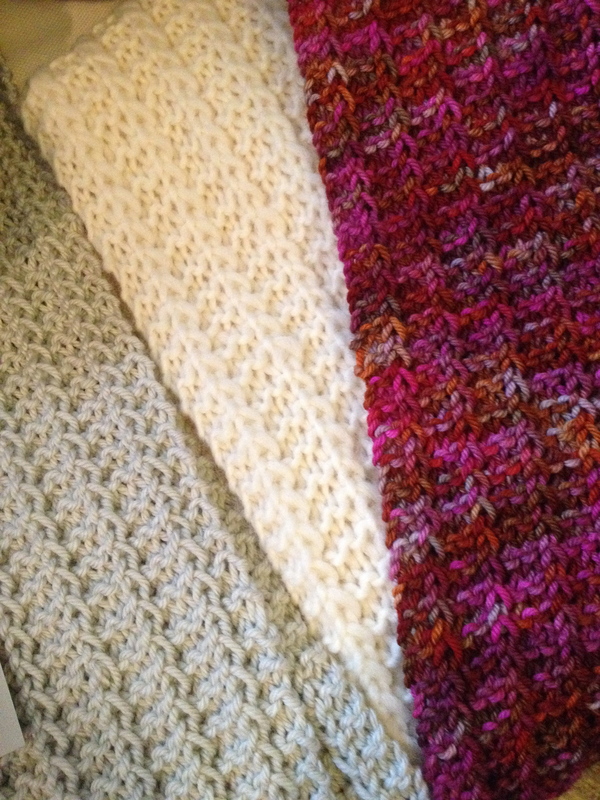 iii) Shop Blankets – I currently have two underway and they are my attempt at “knitting advertising”. Basically they are the big knitted squares blankets I make, but this time have ‘Convent & Chapel Wool Shop’ knitted into them and will hang over our railings as advertisements for the shop. The next major category is Show Knitting. These are the special projects that are entered in the local and more major shows. They can also use shop yarn (preferably) and be displayed in the shop, but not necessarily. I’ll get onto a project or two shortly. The Show season kicks off early February each year and runs mainly through to around May. Of course, I usually leave my run way too late and it’s a rush to complete something in the end. This year I’m thinking of spreading myself a little more and wandering into coloured work and Aran – no, being smashed by Gemma in lace this year has nothing to do with it – well, maybe just a tad! And lastly, Selfish Knitting – knitting just for me. By now you’ve probably guessed that this is totally neglected, although I’ve at least chosen a pattern and put aside some beautiful Hedgehog Fibres yarn for a special treat – another Daybreak Shawl in cape proportions. I’ll keep you posted as some of these categories make progress, but for now here in Kandos/Rylstone, it’s bitter mid Winter (not that we’re complaining), minus one today, so our efforts are best spent on shop mitts and beanies which will keep us off the streets and in business for now. This gorgeous Hedgehog Fibres Pod and Rusty Nail in Twist Sock will one day be a Daybreak Shawl – and possibly tick some boxes as Show Knitting and Shop Sample as well as Selfish. 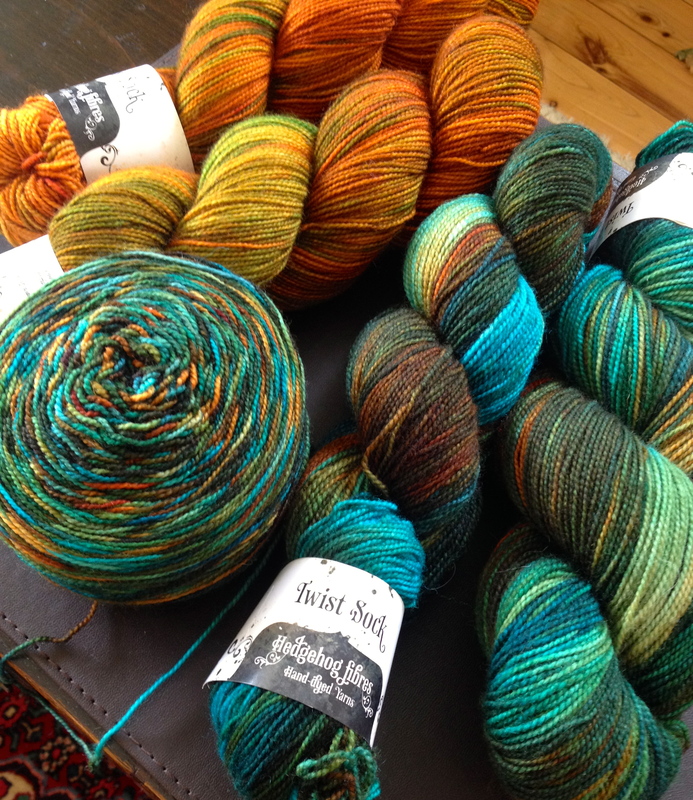 My yarn selection – Hedgehog Fibres Copper Penny and Pod in Twisted Sock Yarn. Cementa_15 has been great but it has been one of those epics that has for months been landmarked by “After Cementa…” for putting off activities and commitments. Now it’s over, it’s time to plan “Post Cementa”. Since opening the Convent & Chapel Wool Shop, I’ve done masses of knitting but it’s all been for the shop. Now I’m about to do something for myself. Yes, it’s with shop yarn and will be worn in the shop, but it’s a pattern I’ve made before and love and with yarn I’ve fallen in love with. The pattern is called Daybreak by Stephen West and the yarn I’ve chosen is Twist Sock by Hedgehog Fibres in Pod and Copper Penny. As usual, it will be overly generous and I’m endeavouring to make it into more of a cape size than a wrap/shawl. Pictures will be posted as it progresses. Timing will depend greatly on beanie, mitt and scarf demand at the shop, which has been substantial over the past few weeks. Time we taught everyone to knit for themselves! Knitted a few years ago but a well-worn favourite and due for an encore!